MAKE YOUR OWN RECYCLED ORANGUTAN, FUN FOR THE WHOLE FAMILY! Orangutans are amazing creatures! They are the ’gardeners’ of their forest habitats, helping seeds to spread through their wide and varied diet. Many of those seeds are especially big ones, which can’t be spread by smaller mammals, and grow into large, land-stabilising trees – crucial in areas vulnerable to tsunamis and landslides. 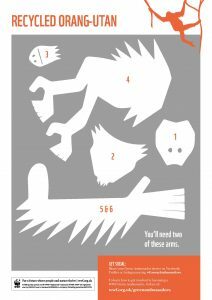 Why not share your love for these incredible creatures by making your own marvellous orangutan using recycled materials! Cardboard box or other thick paper (an old cereal box works well). Thick needle or small knitting needle. Split pin paper fasteners x 2. Cut out the template and lay it on top of the cardboard pieces. Draw around the template and cut out the different shapes carefully. There are two long arms, a body and the three different pieces for the head. Decorate the pieces with paints, pens or collage with paper. We’ve painted the base bright orange and then added pattern in a metallic gold, but you can use any colour you like. Glue part 1 onto part 2 and the glue part 3 on top matching up the nostrils. Draw eyes, eyebrows, nostrils and a mouth. Carefully push a knitting needle or thick needle through the head, top of the arms (parts 5 &6) and the body (part 4). Make sure you ask an adult to help you! Push the split pin paper fastener through the hole and split the pins. The orangutan is now ready to hang onto any branch or door frame! Don’t forget The Jungle Book comes to Blackpool’s Grand Theatre 8 to 12 May with many characters from; Baloo the Bear, Kaa the Wolf, Bagheera the Panther, Shere Khan the Tiger and even the Funky Monkeys! You can get your tickets by either clicking here, or calling our Box Office on 01253 290190.